Number 97! I just looked at what number 100 is going to be, and it’s a good one. With a celebrity no less! This one is really funny, with another great Lone Wolf moment. “Watch your tongue, old man!” I love when he gets irrationally angry, this time because he doesn’t understand what incorrigible means. As you might imagine, it took some research to draw Rodeo Drive. I’ve only been to Beverly Hills once, and that was some time ago. I mentioned early on that part of my goal in writing this arch was to write some more movement and action into the comic, as well as challenge my drawing skills by adding a bunch of new locations. This was a challenging one, yet I drew it all in a day, almost in one sit down. So I’m proud of that. 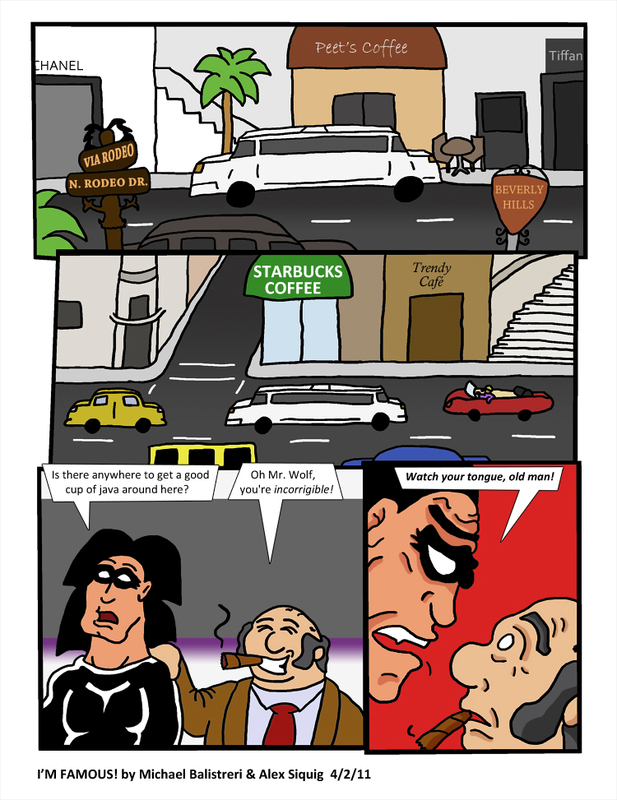 I think I also did a pretty good job of capturing the vibe of the area, while obviously inserting coffee places for the joke. So maybe you can see what’s coming next, if not wait until the next one to see where the story will take us!